Since 1999, Bergen Designs has been providing beautiful Memorial benches to customers in California. From the Northern California Coast to the beaches in Southern California, our benches are used in Parks, Churches and Private Memorial gardens. 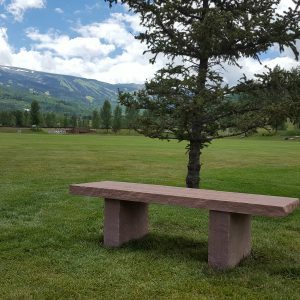 Our memorial benches and garden benches are the most beautiful and natural you can find anywhere, and certainly more appealing – and durable – than the man-made look of granite of cheap concrete benches that doesn’t last more than a few years. Customers who have purchased from us include San Diego Memorial Benches, Los Angeles Memorial Benches, San Francisco Memorial Benches, Irvine Memorial Benches, Sacramento Memorial Benches and all areas in between have been ordering memorial benches from Bergen Designs for over 16 years now. 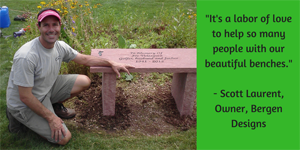 Installation and assembly takes less than an hour to complete once your memorial bench arrives. I can’t tell you how much I and the family appreciate: your labor of love, your skill and your attention to the finish of a project that can never be duplicated. Shipping has never been easier- We use the largest freight carrier in the world and that allows us to include shipping in the price no matter where in the country you live. 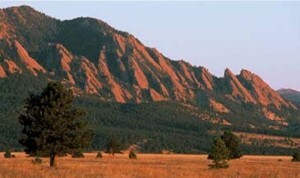 In some very rural areas there might be an extra charge but that does not happen often.